Chris Matthews on Monday got a much-needed lesson from Rep. Paul Ryan (R-Wisc.) on how tax hikes impact the budget as well as the economy. "Congressman Ryan, is there any tax role for reducing our $1.4 trillion to $1.7 trillion debt this year -- deficit this year?" Matthews asked during the 5PM installment of MSNBC's "Hardball." "Is there any role in tax increasing to help do that job?" When Ryan gave an answer Matthews didn't like, the host arrogantly responded, "So, you won`t cut -- you won`t raise taxes and you won`t cut spending...All this bitching about the deficit doesn`t mean squat, because you won`t do either, raise taxes or reduce spending." CHRIS MATTHEWS, HOST: Congressman Ryan, is there any tax role for reducing our $1.4 trillion to $1.7 trillion debt this year -- deficit this year? Is there any role in tax increasing to help do that job? It seems to me every Republican that goes on "Meet the Press" lately is asked, where will you cut? They say nothing. They will not mention any cuts. MATTHEWS: So, you won`t cut -- you won`t raise taxes and you won`t cut spending. From here it became obvious what Matthews was up to. He's not interested in balancing the budget. He's certainly not interested in cutting spending. What he's interested in is getting Republicans to say what programs they want cut so that Democrats can use that against them in the upcoming elections. MATTHEWS: I just don`t see -- I just don`t see any program cuts. You`re talking in general terms, but let me tell you this: the major Republicans that come on television will not cut Social Security, Medicare, and Medicaid. They won`t cut the military. They can`t cut debt servicing. They won`t -- they won`t get rid of a major cost of government. RYAN: -- with specific reforms to the entitlements you mentioned. MATTHEWS: -- just take a chunk out that 1.4 trillion by getting rid of a big program or good expenditure that people now watching can understand. Cuts in entitlements? Matthews didn't ask Ryan to cut entitlements. Matthews asked him what he would cut to balance the budget and Ryan complied. As such, Matthews was being completely dishonest. This wasn't about balancing the budget. PAUL: You asked me discretionary. REP. JOSEPH CROWLEY (D-NY), WAYS & MEANS CMTE. : Well, I did notice there, though, Chris, was he didn`t mention at all his plan to privatize Social Security. Again, going back to the same old Bush agenda, the failed Bush agenda, the American people rejected in the election of Barack Obama and the Democratic majority in the House and the Senate. CROWLEY: -- really just -- really bring back more fiscally responsible Congress, more responsible government. It has worked in the past. Chris, I think it will work in the future. The president has said he wants to cut this deficit in half and I want to help him do that. MATTHEWS: OK. Let`s get back to the bottom line. Are you comfortable going to the voters, Congressman Crowley, with a proposal to eliminate the $250,000 and above tax cut? CROWLEY: I could tell you, Chris, in my district, there are very few people who make more than that money (INAUDIBLE) just a gross income of $250,000 or more. And I think, to live in the greatest country, as I said before, the world has ever known, it`s a small price to pay. MATTHEWS: Let me ask you, Congressman Ryan -- you have no problems defending tax cuts for people who make over a quarter a million a year? 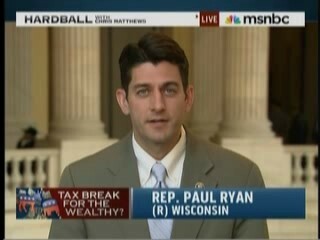 RYAN: Small businesses -- go to Wisconsin. MATTHEWS: No, no, individuals. It`s an individual tax cut. RYAN: No, no. You have to understand, Chris, 75 percent of those people who pay that tax rate are small businesses who file as individuals, not corporations. That`s the problem with this economic argument, Chris, is when you think you`re just taxing rich people like Bill Gates, what you`re end up doing is you`re hitting successful small businesses. When we tax our employers more than our foreign competitors tax theirs, they get our jobs and we lose in global competition. So, we ought to be keeping our eye in economic growth and job creation, what`s necessary to do, and that means low tax rates on businesses and small businesses in certainty. We have a whole new tax on certainty that`s hurting economic growth. We need to give taxpayers certainty that they`re not going to have a huge wave of tax increases in 2011 and then another in 2013. RYAN: I would argue that`s depressing economic growth and costing us jobs. MATTHEWS: So, when the debt commission comes back this fall, and as a two-to-one cut in spending and a $1 increase in taxes, you`ll oppose it? MATTHEWS: If the proposal is for $2 in spending cuts, and $1 tax increase, you`re going to oppose the majority position on that? RYAN: I don`t think it`s good form to do table talk, what`s on the table or off the table in the debt commission. I`m hoping we could put a really good dent on the problem. MATTHEWS: OK. Well, I`m with you with that. MATTHEWS: -- and Paul Ryan of Wisconsin. Unfortunately, Matthews' behavior here was indicative of virtually all on the left in our nation today, especially those in the media. The Republicans have been offering budget-cutting plans since this Congress was sworn in, but the majority Party in power continually refuse to listen to any of their suggestions. Like a dutiful foot-soldier, Matthews continues to tell his tiny audience that the GOP is just saying no to obstruct everything his Party wants to enact. As Ryan marvelously demonstrated Monday, nothing could be further from the truth?